FIRST WINDOW OPEN FOR SUBMISSIONS: AYAP RED LIGHT/GREEN LIGHT CONTEST! 0 FIRST WINDOW OPEN FOR SUBMISSIONS: AYAP RED LIGHT/GREEN LIGHT CONTEST! 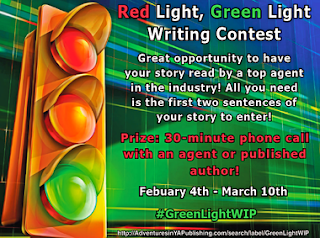 Our Red Light/Green Light Contest, judged by literary agent Patricia Nelson of Marsal Lyon Literary is now open to take the first 25 submissions until 3PM Eastern today! The submission window will remain open until we've filled 25 contestant slots plus some additional alternate spots in case of disqualifications. Ready to enter? Go HERE NOW! If you miss the window, try again at 3pm Eastern/Noon Pacific, when we'll take an additional 25 entries plus alternates!